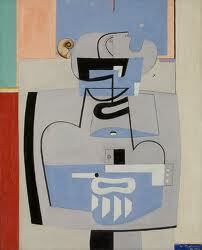 The two artists that I chose are Le Corbusier and Fernand Leger. Both of these works represent the purist movement in art. The lines in their work are very clean, and define the forms of the objects and outline the different elements. Le Corbusier’s Petite Confidences from 1920, labeled “First Scene, Urban Architectural Objects” is an attempt to look at the different forms and shapes found in objects from the still life set-up. The moments where the objects overlapped in the setup, is interesting because the lines and boundaries carry throughout the rest of the drawing. The lithograph technique creates the opposite effect than a drawing in that the background is dark and the lines are highlights. Le Corbusier’s drawings overlap his painting, in that they look into objects in an architectural way. I chose Le Corbusier because he illustrates the relationship between drawing and architecture and portrays these objects as architecture. The way he draws them is in a form of architectural drawing that is referred to as axonometric. This means that both the plan and the elevation of the object are visible at once, in tandem. This is significant because you get a sense of the objects volume and the full mass. Le Corbusier is a very special architect and artist in our studies of architecture and his work is used as an example throughout the program and inspires many of our assignments. The use of line and the different techniques in the drawings are key in portraying information about the objects. There is a build up of line in some areas, and hatching to represent depth and shadows, as well as single contours. His acknowledgement of the shadow as form also adds to the idea of these objects as volumetric and draws that idea that they are architecture, just as buildings cast shadows. Also in his works he explores the idea of architecture becoming a still life and the effect of when the two ideas coincide. Although each line is simply that, they become as boundary, an object’s form, which when it comes into contact and overlaps and interacts with other objects results in the making of architecture. This idea is something that is new and very intriguing to me, something that was introduces to me here in the architecture school, but is changing the way I look at everyday objects and how they can become art and architecture. Fernand Leger’s work is also very similar to that of Le Corbusier’s. If we look at Corbusier’s Logarithmic Spirals, we can see the ways they both portray human forms in the same way. There seems to be a flattening of the forms, almost similar to the style in which ancient Egyptians worked. The outlines of the figures contrast with the toned and colored areas of the work; they are thick dark lines. The use of bright colors makes the tapestry interesting and fun to look at. Also something different about this piece than a painting or drawing is the grain or direction of the weave. The fact that it is woven gives it unique texture. These two artists have similar styles, and both have a way of investigating the forms of people and objects that reflect architecture. I like Leger’s work as well because it is illustrating an event and recording a story of some kind. We’re not exactly sure what is happening, and are left guessing, but that is what makes this piece an intriguing piece of art. I was also extremely excited to see some of Calder’s work because they reflect the aesthetics of his sculpture and mobiles, with bright colors and lines. I think the relationship between painting and sculpture and the progression from drawing to three-dimensional form is also very interesting and significant to architecture. We discussed Henry Moore and Calder in our studio course, because we are designing a studio for a sculptor. It is very special to me when I see the overlap and relation to both art and architecture. Architecture can be seen as sculpture as well, and vice-versa in my opinion, another example of how art can have an impact and meaning beyond what we think and influence many different parts of our culture. 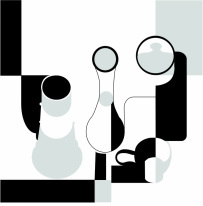 My visual response is a recreation of Le Corbusier's still-life using my own objects. It is done in the axonometric style that he employs in his works.